It should have been a touchdown. It should never have been overturned. Let’s get that out there, and make it clear that I think Kelvin Benjamin’s catch should have been a touchdown. But I also understand that it doesn’t matter what I think, what Bills fans think, what coaches think or even what former former NFL Head Officials think. The NFL office in NYC has the last word. Until the catch rule changes, that’s what we all have to adjust to. That includes the players. Following the Benjamin play, and a very good explanation by CBS’ Jim Nantz & Tony Romo, I tweeted out that Benjamin deserved some of the blame. Had he made a clean catch, there would have been no way the score would have been overturned. Here’s the official NFL explanation from current NFL Head of Officiating Al Riveron. If Benjamin catches clean with both hands right away, it’s a TD. The slight bobble delays the catch and effects when the foot is down. Got to make a clean grab. As you might expect, Bills fans didn’t care to hear this point of view. But my job is to explain why plays happen and why calls are made. As I watched the replays, I did see that Benjamin did not catch the ball cleanly with both hands when it arrived. 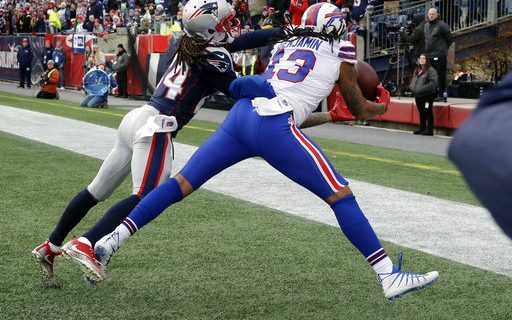 Yes, Stephon Gilmore’s hand was in there, likely preventing that from happening. So maybe pass interference should have been called. But much like Jesse James in Pittsburgh the week before, players are now facing the reality of having to learn how to make catches that don’t give replay a chance to change the call. If Benjamin catches clean, it’s a TD. If James rolls onto his back as he falls into the end, it’s a touchdown. Yes, I’m asking these amazing athletes to do some things that may be physically impossible, even for them. But you’ve seen receivers around the league start to flip over onto their shoulders as they go to the ground as a way to avoid the ball hitting the ground, and giving replay a chance to overturn. I would expect NFL receivers coaches will start to teach new skills designed to make it harder for NYC to overturn plays. Technology has now allowed us to go frame by frame to see if balls wiggle or shift. It’s the curse of HD, 4K, and 80″ flat screen monitors. Should the catch rule be changed? Yes. Should it be simplified, so we all know what a catch should be? Yes. Will that happen? Doubtful. Now that we can see everything, I fear there is no going back. Because the next time a Benjamin play happens and it isn’t overturned, there will be an equally loud outcry from every den, living room and sports bar in that team’s town. The most interesting offshoot of the Benjamin rule came from former officiating heads Mike Pereira and Dean Blandino. regarding the Buffalo no touchdown, nothing more irritating to an official than to make a great call and then someone in a suit in an office in New York incorrectly reverses it. It is more and more obvious that there isn’t a standard for staying with the call on the field. They are indicating that the real officiating is being done in NYC, from the NFL’s control room. The stripes on the field are really becoming irrelevant. That could have many more far-reaching effect on week-to-week games. I ache for Bills fans, who feel like the Patriots and the NFL stole another one from little old Buffalo. I agree, but I don’t waste too much time obsessing about it. I want to learn why calls are made, games are won, games are lost, plays are called. Then, I can make an educated decision. I hope this provided some of that for Bills fans. I’m not asking you to like it. In fact, because you’re fans, you shouldn’t like it.